Okay, I often eat out in Whalley despite its dubious reputation. Honestly, if you look at all the development taking place, this will be a very different place in the future. Alright, with that being said, there are some restaurants that still look quite dodgy. So much so, I'm a tad nervous to try them. Last time, it was nice that fellow bloggers accompanied me to Fireside House of Cheesecakes. This time around, Toolman was nice enough to join me in trying out Seoul House Korean (which was recommended by JuJu, who happens to be Korean). 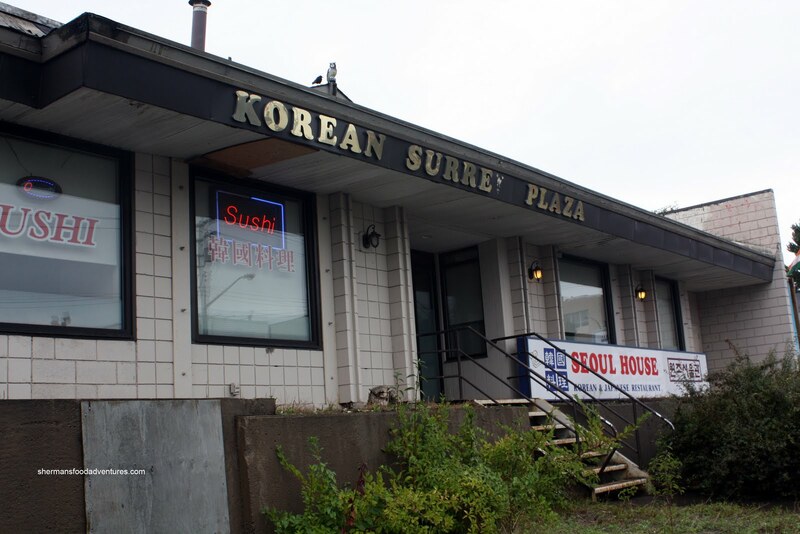 With an exterior that resembles an abandoned Asian supermarket, we were not even sure if it was open. 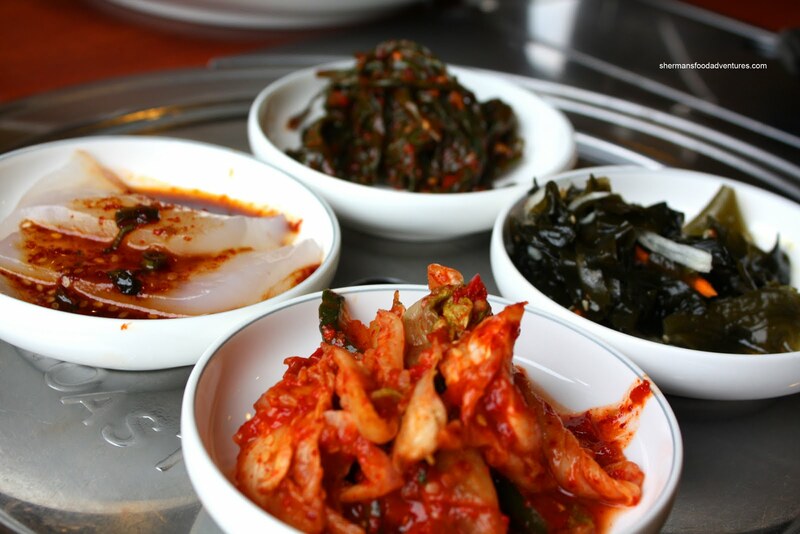 So we started off with the complimentary Banchan (actually we didn't, it showed up much later; but whatever...). Pretty good in my books. A little bit different variety than we are used to. 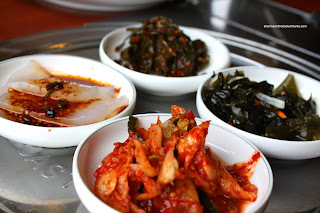 We had Pea Curd, Kimchi, Wakame and Mustard Greens (?). For our first dish, we had Japchae. Pretty good portion for the price, although there seemed to be an inordinate amount of veggies to noodle ratio. Not too oily and nicely seasoned, this was good. 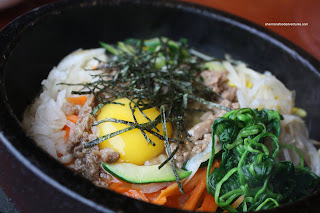 Doing my usual Korean dishes (well, and the fact we couldn't read half of the menu), we got the Dolset Bibimbap. As you can see from the picture, the veggies were colourful and plentiful. The rice was on the mushier side; but some of it became drier since it cooked some more in the hot stone bowl. 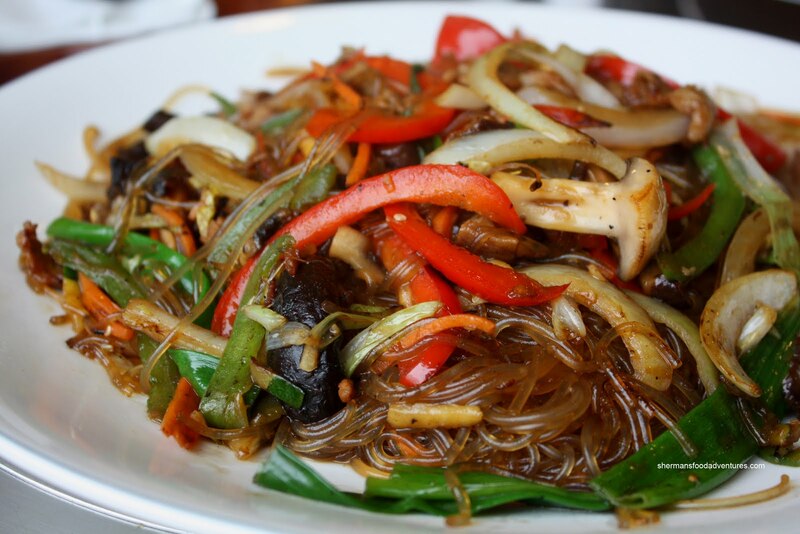 For our last dish, I didn't remember the Korean name and I also didn't have time to Google it either. Thus, I had to ask for it in English which was somewhat of an exercise with the server. Her English was as good as my Korean... We did figure it out. That being the Pork Bone Soup. The bowl arrived packed to the brim with tender pork and a slightly spicy broth. The broth itself could've used a bit more depth, all I could taste was spice. But honestly, I'm nit-picking here. The food is pretty solid and inexpensive. We didn't try the Japanese food for obvious reasons and based solely on the Korean food, Seoul House is a good option in Whalley. - Didn't try the Japanese food... I guess that was a good decision? These reports of restaurants where the servers have limited English (and even worse, the ones where the servers get snarky about it) always make me scratch my head. Are the owners happy with targeting just the people in their local market who speak the language, and not interested in expanding their market to folks from other cultures? That doesn't make for a good business decision, in my view, but maybe it works for them? Tony, you would think eh? I've been to a few Korean and Chinese restaurants and the staff do not know English. Thankfully I can speak Cantonese so that takes care of one type of restaurant. 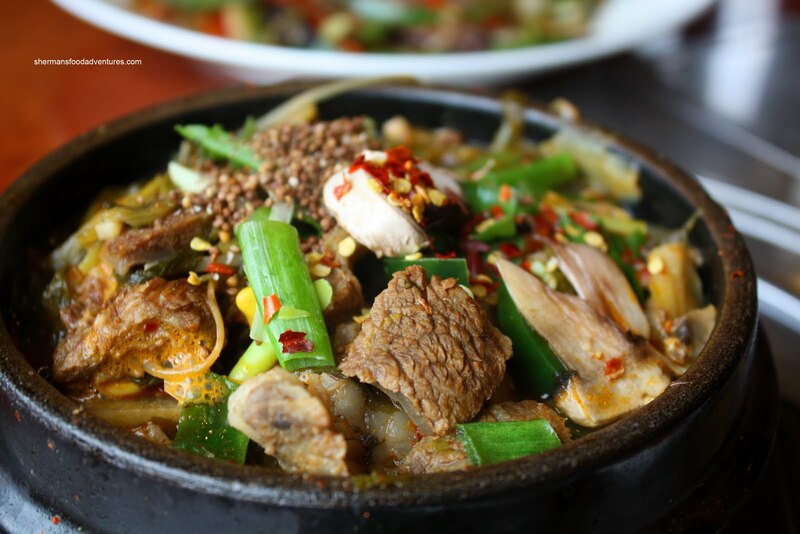 The pork bone soup is called "gamjatang"
J-Roo, thanks for the info. Now only if I can pronounce it right! The Seoul House is now closed. @ML Thanks. I've been meaning to do this... but keep forgetting. I was just across the street at Afghan Bakery for heaven's sake!